Attributions and conjectures: 105.310 J.N. 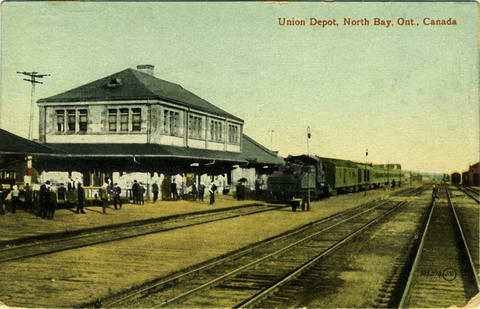 on the front suggests it was created by North Bay photographer John A. Noel. Item is a postally used postcard depicting the later C.P.R. station, tracks, train and passengers with baggage carts on the platform. Message reads: Dear Mother. All O.K. Hated awfully to leave you. Had very pleasant call on the Frasers in Montreal. Was on go every moment while there or would have written. Postmark S.S. Marie. Addressed to: Mrs. Marcus Gardiner, Hadley, Saratogao Co., N.Y., U.S.A.